By Mustaza Mustafa in Desktop. Updated on May 12, 2018 . In this digital age, documents are transferred wirelessly and officials no longer provide signatures for the paperwork they release. In some cases when a signature is required, you only have to print out the document to apply a signature, scan it and email them back. Your physical presence at the signing venue is not needed although for some, all of this is still considered a hassle. Rather than waste paper, ink and time, why not use a digital signature instead? 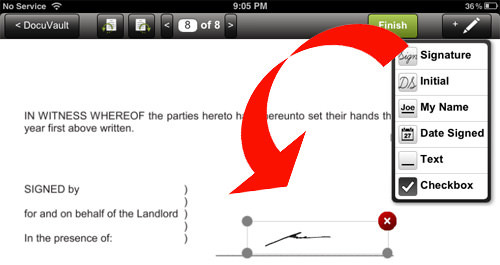 This article will show you how to leave a signature digitally on your documents. 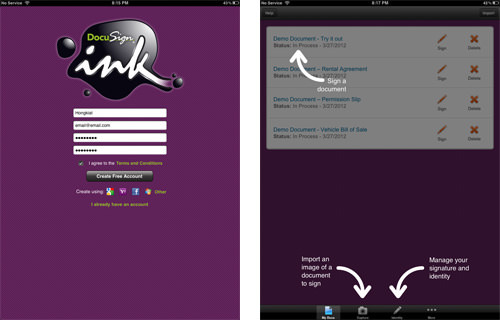 The signature can also be applied straight on your smartphones and tablets with DocuSign Ink. DocuSign Ink is an application that allows users to leave signatures electronically, fill up a form, return the signed document to your email as an attachment, or send it as an email elsewhere. You can also keep ’em in cloud storage for use later on. To start making your own digital signature, head over to the DocuSign Ink page, download and install it to your device. You can also download directly from the Apple App Store and Android Market. Once installed, open the application and fill up your information for registration purpose. You can also register with Google ID, Facebook and Yahoo!. After registering, sign in to the application and you will see a guide snapshot. Now the first thing to do is to set your identity, so it will be easy to place a signature to your documents. Click on the button ‘Identity’. 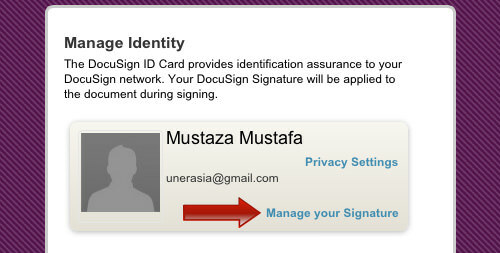 You will be redirected to your DocuSign ID Card, click on ‘Manage your Signature’. 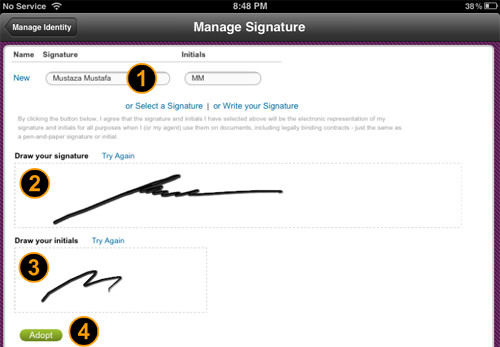 In this ‘Manage Signature’ page, you can change your name and initials to be used in documents. Then go to the ‘Draw your signature’ section to start placing your signature, and then proceed with your initials. Once you are satisfied with the final result, click the button ‘Adopt’. You will see a preview of your signature and initials, click ‘Done’ if you are satisfied. Your DocuSign ID Card is now updated, open any document on your device from your device storage, email or even cloud. Once the document is opened, you will see a button at the top right corner of your document that says ‘Open in DocuSign Ink’. Click that button. 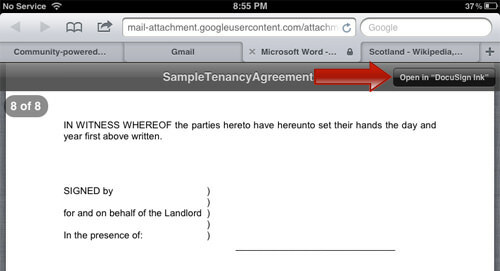 The document will now open in the DocuSign Ink app. At the page where you want to place your signature, click on the pencil button at the top right corner to see a drop-down selection. Now hold down on the ‘Signature’ button and drag it over to where you want to place the signature. Once it is placed, you will see a rounded corner around the signature, drag it again to change the size of your signature to suit the document size. When you are satisfied, click on the ‘Finish’ button at the top right side of DocuSign Ink app, and click ‘Yes’ to confirm. Once saved, your document will be kept in DocuSign Ink’s storage called ‘DocuVault’. You can now email the document to any email address by clicking on the ‘Email’ button, or you can delete it permanently. Not only is it easy to use DocuSign Ink, it also saves time and prevents unnecessary printing of a document that is not needed to be kept. Now you can save your signature securely with DocuSign Ink and repeat the same process for all your documents in the future.